﻿ Static excitation systems for medium generators and motors – KONČAR Elektronika i informatika d.d. Powerful compact solution for medium generators and motors. Static excitation system with KONreg digital voltage regulator was built around powerful, programmable processor unit, which allows the execution of regulation and control in real time, with fast response, high accuracy and reliability. The system is designed so that it can be completely customized to customer requirements, both for new facilities / projects and for reconstruction of the existing ones. 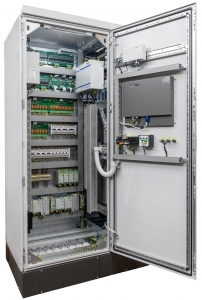 The system consists of excitation transformer, digital voltage regulator in a single channel version (dual-channel version is available on request), thyristor converter (1 + 1 or n + 1 configuration-on request),de-excitation circuit (DC or AC), overvoltage protection, and field flashing (from DC or AC power source). Also, at the request of the customer, within our system we can supply equipment for the electrical braking. The ideal solution for hydropower plants. The static excitation system with KONreg digital voltage regulator system is fully developed according to the latest industry standards. Equipment is fully adapted to all operating modes of generator excitation regulation system, protection and communication, according to all important communications protocols.